Just about a week ago, India looked confident and determined to achieve their goal of a ‘revenge’ series whitewash. It had all gone according to script in the first Test – a slow track at Motera, England as expected succumbing to spin, and an easy 9-wicket triumph for the hosts. But captain MS Dhoni said that he wanted a track which turned from the first ball for the next Test. His wish was fulfilled, and he had everything on a platter. Yet his team’s fortunes turned around amazingly, as it crashed to a ten-wicket defeat. Forget a whitewash, England seem the better team at the moment. Dhoni has never been a good Test captain, and we all know that India’s rise to World No.1 in late 2009 was on the back of victories at home or against lesser oppositon. Last season the team returned a horrendous showing, getting blanked in both England and Australia. The problem is, India just does not have an alternative to Dhoni as captain – Sehwag’s form is volatile, Gambhir has been below average for quite some time, Kohli is still young and inexperienced. But while Dhoni will go down in history as a good one-day skipper, he has been repeatedly found wanting in the longer format. Defensive fields, allowing easy singles, letting Ashwin bowl around the wicket when the need of the hour was to attack – his below-par captaincy was in display in Mumbai. Add to that his poor batting in Tests – when was the last time he played a crucial Test innings? Dhoni’s poor batting form brings us to the rest of the Indian batting. 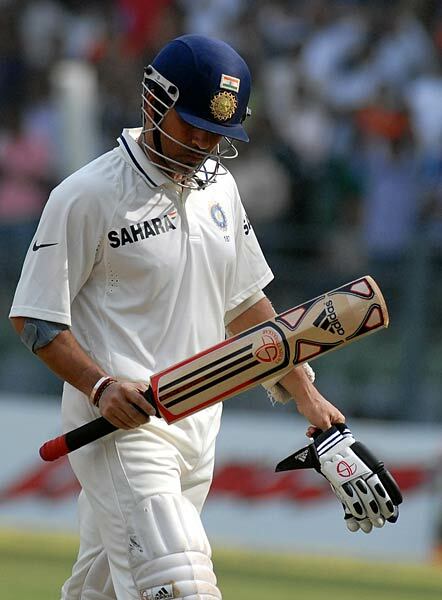 The grand old man of modern Indian cricket, Sachin Tendulkar, averages a measly 15 in his last ten innings. His reflexes have slowed down, he does not seem like getting back into form at the highest level – yet former players assure us of ‘one big knock’ from him that will ‘silence his critics’ and obviously, prolong his career further. But when will that ‘big innings’ come? No one knows. The Indian spinners missed a few tricks in Mumbai. Ashwin bowling around the wicket was a very defensive approach. While the English spinners bowled faster through the air to keep the batsmen guessing, the Indians looked for bounce and flight, which gave the likes of Pietersen ample time to swat the ball to the boundary. As the Mumbai pitch curator Sudhir Naik said, ‘if Dhoni is ordering doctored pitches, he should know how to prepare to play on such wickets too’. Indeed, Dhoni’s spin theory horribly backfired. Over to Kolkata now. Perhaps Dhoni can play Ashok Dinda and drop the off colour Harbhajan to restore the team balance, but Dhoni seems adamant about his demands. Meanwhile, England now have a serious chance of winning the series. Its amazing how fortunes can turn around in a week – that is the beauty of Test cricket.